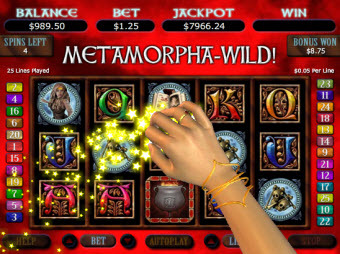 In June of 2010 Bodog Casino released a brand new online slot machine, perfect for those that like a little magic in their lives, and let’s face it, we could all use a bit of magic dust sprinkling its way along the reels of our favorite online slots games. The game, one of the latest releases in the Reel Series Video slot collection, features 25 magical lines, spinning along five slot machine reels. The slot games lines are read from left to right, with the obvious exception of the machines scatter symbols. A scatter win is multiplied by the total credits bet on the spin the scatter symbol, the Magic Wand, is spun. This makes sense, and is another reason for always betting the maximum amount possible, and lowering the coin size, not the amount of credits whenever possible. The games Wild Symbols, the Cauldron Symbol, can be used in place of any other symbol, except for a scatter symbol of course. Use a wild to create a winning combination, and just like magic the prize is doubled. 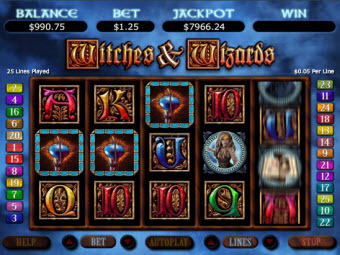 As do many of the slots games at Bodog Casino, this game includes a free spin bonus round wherein a spell casting multiplier will be activated. To activate the free spin bonus, you only need to spin up a set of three Magic Wands. Once that part of the spell is cast, the game will conjour up 10 free spins! 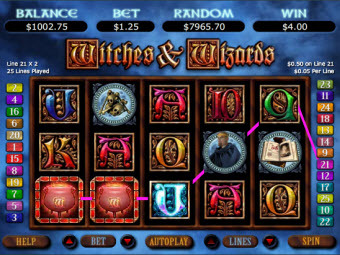 Every one of these free spins offers an opportunity for a magical spell to be cast, if the spell should be cast upon the machine, everything changes. The Enlargement Spell is cast on the wild symbols in the game, lifting them up, and making them span an entire column. If a wild symbol creates a winning combination while it’s under this spell, the winnings are effect too, in that they are multiplied by 4! Another spell may change all of any symbol (the King Symbol for instance) into Wild Symbols, this can be done with any wild symbols. If you’re betting the right amount, and the right pattern gets a make over, this spell could actually be life changing! Another spell this machine casts makes Wild Symbols randomly appear on the screen, just taking over other symbols at random, and giving you free credits when it happens. This machine is just full of spells, and bells, whistles, and magical madness, to check it out, head to Bodog.com and check out the casino. If you don’t already have a Bodog casino account, sign up for one by clicking any link on this page, and you’ll automatically receive the maximum available Bodog 1st deposit bonus. We’ve tried to cast a spell on all our links for you so that you’ll win the big jackpots at Bodog Casino.